Given sufficient life, coral will actually produce oxygen and absorb carbon dioxide. Carbon dioxide can poison animal life. 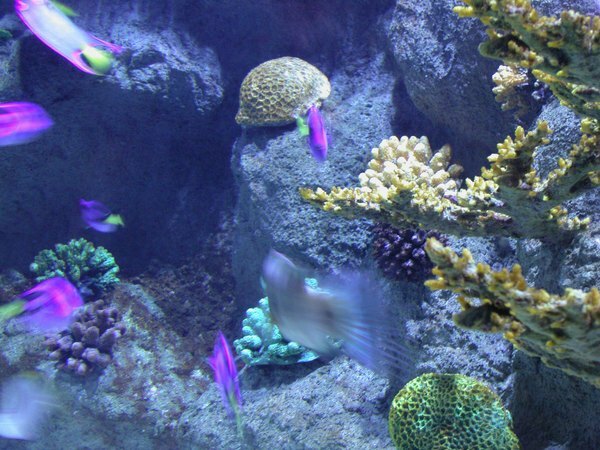 In an aquarium, it will rarely build up to a dangerous level, since most processes that produce excess carbon dioxide will cause other problems first. But an awareness of carbon dioxide can help head off these other problems before they get critical. Never use a carbon dioxide test for a marine aquarium. Most, if not all, carbon dioxide tests are designed for freshwater aquariums. The higher pH of marine tanks can render their results meaningless. Instead, test for carbon dioxide indirectly. Using a saltwater pH test kit -- which you should have anyway for marine aquariums -- test the water throughout the day. Small changes in pH throughout the day could indicate changes in carbon dioxide amounts. This holds particularly true if pH is lowest in the morning and gets higher until you turn off the lights in the evening. If you have concerns, test the pH, then add an air stone to the aquarium. Test again after 20 minutes. If pH increases, you could have issues with carbon dioxide. In general, if carbon dioxide levels get hard enough to harm fish, something else is very wrong. Declining oxygen levels are more of a concern than rising carbon dioxide in a marine aquarium. You want the oxygen levels to stay above 5.5 mg/l, ideally at 8 mg/l. Carbon dioxide should stay below 2.0 mg/l. However, no normal process in a saltwater aquarium will raise carbon dioxide to a dangerous level without dropping oxygen to lethal levels first. 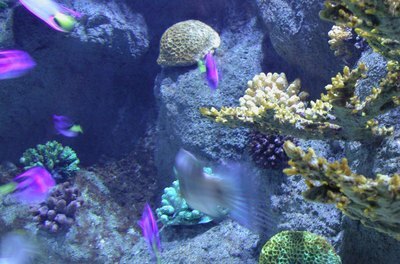 A low oxygen level or high carbon dioxide level can cause a wide variety of problems in an aquarium. Fish change their behaviors. For example, fish will become sluggish and may hang out near the bottom of the aquarium. Other time, fish may flap their gills rapidly, more often than twice a second, or "gasp" at the water's surface for breath. Coral and other invertebrates may shrink back, retracting their tentacles. Invertebrates may show less of a response to light and other stimuli. If you have low oxygen levels or high levels of carbon dioxide, you can improve the situation a number of ways. One way is to change the intensity and duration of your lighting. This gives coral and other photosynthetic organisms more energy to convert carbon dioxide into oxygen. You can also increase water movement. This encourages gas exchange with the air, allowing excess carbon dioxide to leave the water, and more oxygen to enter it. In a few specific situations, an increase in carbon dioxide can be a good thing. Carbon dioxide reversibly increases the acidity of water. This makes it easier to dissolve calcium into the water, where calcium-using organisms like coral and clams can use it. A calcium reactor is a piece of aquarium equipment that takes advantage of this effect. It bubbles carbon dioxide into water, isolated from the tank water, and run this acidic water through calcium-rich water. Water movement encourages the extra carbon dioxide to out-gas from the water, leaving the water calcium-rich and ready for the aquarium. How Does a CO2 Diffuser Work in an Aquarium?